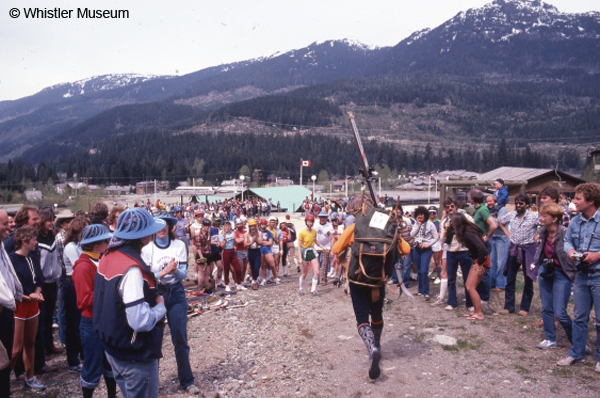 The Victoria Day Weekend in Whistler during the 1980s (and late 1970s) was all about May Day Madness and one of Whistler’s favourite races: the Great Snow, Earth, Water Race! Photos of the events dominate these weeks in the Whistler Question Collection for each year. Mayor Pat Carleton welcomes Captain James Cook in front of the mural decoration at the Myrtle Philip School gym. Two of the Burnt Stew Beavers paddle furiously in the Great Snow, Earth, Water Race. While May Day Madness shirts are on sale from the Whistler Answer. The May Day Madness continues with sack races on the school yard with divisions for children, males and females. An anonymous diver showing fine form in the bellyflop contest. The canoe portion of the Great Snow, Earth, Water Race heads out on Alta Lake. A runner nears the finish line at the school. The winning team Helvetia: Heinz Zurcher, Kaarina Engelbrecht, Franz Bislin, Kathy Zurcher and Josef Bislin. Chris Carson gives his rendition of “Bobby McGee” with help from Scott Richard, Greg Beauregard, Matt Satre, Marcello Gianna, Mr. Marshall and an all-girl chorus. The Whistler Village continues to be a work-in-progress. The Keg building hits the road on its way to its new home on Blackcomb Way. Constable F. Pinnock runs through the bike safety testing course that he and Constable Gabriel of Pemberton set up at Myrtle Philip Elementary on Friday, May 22. Young participants in the recent “Bike for Life” mini-course and several Girl Guides successfully rose their bicycles through the obstacle course to earn certificates for their cycling expertise. Kurt and Maralyn Snook cut the cake at their going-away party in Stoney’s back room on Friday, May 22. Andrew Wuolle, Sherida Snook, Morag Marshall and Jody Rustad planting one of the many Douglas fir trees around Myrtle Philip Elementary school yard on May 22. Tree seedlings were donated by the Ministry of Forests. Sports fans turned out in droves to dig through the used equipment at Blackcomb Ski Club’s sports swap during May Day Madness. The $1000 raised from sales will go towards building a club facility. They’re off to a Le Mans starts for the Eighth Annual Snow, Earth, Water Race in Whistler May 22. This fleecy rider just stopped in for a while to observe the scene at the Great Snow, Earth, Water Race. While master checked out some of the canoe action down by the river, moto-mutt stayed with the steed. Though not in first place, the Burnt Stew Beavers were back for another race! For many more photos of the Great Snow, Earth, Water Race take a look here and see if you recognize anyone! Jeff Wuolle serves up pancakes to some of Whistler’s finest flat feet Saturday morning. Being served are (l to r) Constables Steve Davidson, Richard Guay, Rocky Fortin and Gord Simms. Rotary netted $231 from its pancake sales. Chefs, firemen and event E.T. turned out at the bike decorating contest Saturday with some fantastically creative ideas. Most Original: Christopher Forrest, on a fire truck complete with hose. Funniest: Stephanie Simpson as The Egg. Prettiest: Melanie Busdon as Miss Strawberry Shortcake. And the exciting ninth annual Great Snow, Earth, Water Race. Although the weather was great Sunday and Monday, Saturday was a damp one and it actually snowed on Tuesday. How do different colours absorb heat? and What does a barometre measure? were some of the questions students from Myrtle Philip School had to answer in the third annual Science Fair. All children, including kindergarten students, took part in the fair which was designed to give students a chance to use research skills, art talent and writing and speaking abilities together on one area of science in which they show interest. First place winners for each grade include: Grade Seven, “Lasers” by Lisa Morten and Karen Wylie; Grade Six, “Colours and Heat Absorption” by Michelle Rennie and Andrea Wuolle; Grade Five, “Weather Reporting” by Stephanie Fosty; Grade Four, “Guinea Pigs” by Jennifer Croghan and Melanie Busdon; Grade Three, “Eclipses” by Madeline Domries; Grade Two, “Volcanoes” by Briton Liakakos; Grade One, “Monkeys” by Justine Adams, Davey Blaylock, Marco Feller, Casey Greenwood, Aaron Gross, Cory Gudmundson, Yosuke Hamazaki, Jake Humphrey, Mark Jennings and Heather Paul and “Pulleys” by Christopher Systad; Kindergarten, “The Seashore” by James Balfour, Armen Evrensel, Sarah Fennel, Noah Fordham, Christopher Forrest, Moriah Johnston and Tyler Manson. The Great Snow-Earth-Water Race Returns! The Great Snow Earth Water Race is being revived in 2014. A truly organic Whistler experience, we at the museum are really excited to see the return of this awesome event. 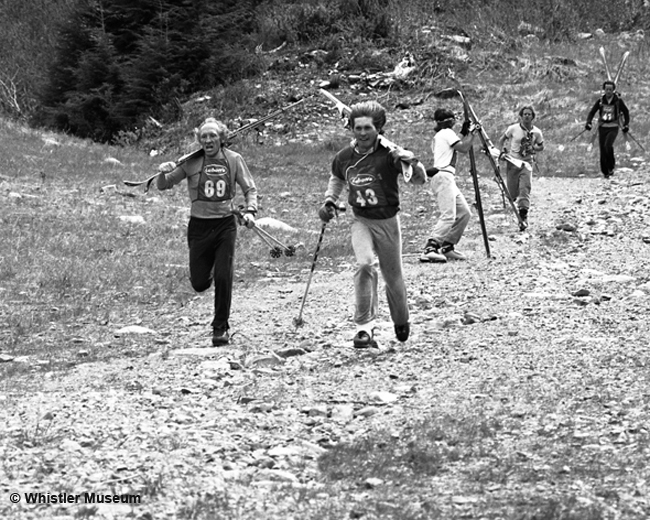 The original race began in 1975 and involved skiing, canoeing, cycling and running. Thirty teams composed of five men and women took part in that first year and the race was won by a dream team made up of Dave Murray, Trudy Alder, D.J. Muzullo, Nancy Greene Raine and Joe Czimazia. In the beginning there were very few rules, so a certain amount of “questionable” tactics were employed, including driving down the mountain! Competitors began at the top of Whistler Mountain where they would ski to wherever the snow finished. From there they would have to run the rest of the way down to Creekside (in ski boots, carrying their skis). At Creekside the baton was passed off to a cyclist, who would ride around Alta Lake and pass it off to the canoeists. The paddlers worked their way up the lake to the first weir on the River of Golden Dreams. Then they handed off to runners who ran back along the highway to Creekside. Apparently, the canoeing was the most amusing part for bystanders. 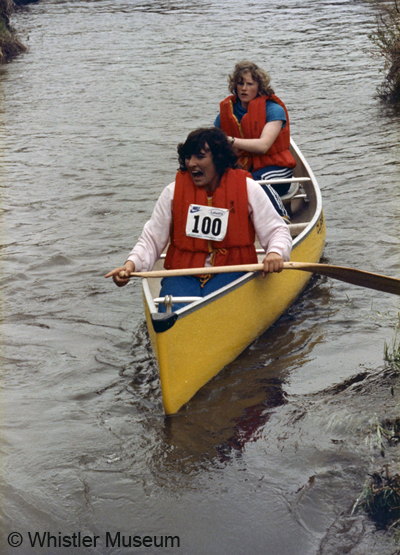 Dave Steers recalls, “Most of the teams had members who could tell the front of a canoe from the back. A few teams didn’t even have that.” Consequently there were plenty of tipped canoes and great hilarity for all. As the years went on the race evolved to include more sports. In the 2014 revival there will be six stages: ski or snowboard touring, ski or snowboard downhill, downhill mountain biking, running, canoeing and cross-country biking. If you fancy putting a team together it’s sure to be hilarious fun. Visit http://www.greatoutdoorsfest.com for details. The race is also in need of volunteers to help all go smoothly, so if you have spare time on May 18th and want to sign up for a piece of pure Whistler fun, you won’t regret it!